We enjoyed tasting the eight new Kellogg's products that are now available at grocery stores across Canada. 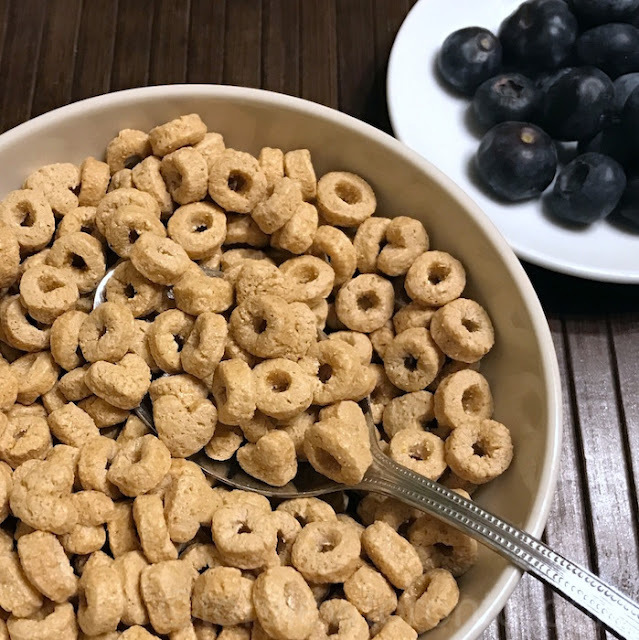 We like that the tasty options of cereal and snacks have visible ingredients and delicious flavours that everyone in the family are sure to enjoy. Nourish granolas have crispy, popped quinoa, puffed rice, wheat and toasted oats that are perfect to enjoy with milk, yogurt, or added to smoothie and had for breakfast or snack. Nourish granolas are available in two varieties: Mixed Berries and Dark Chocolate Coconut. All Bran Granola Cranberry Almond filled with raisins, cranberries and almonds have nine essential nutrients, and it is high in fibre, and low in sodium and fat. Kellogg's All Bran Multi Grain Crunch Cereal has become our favourite. We love that this cereal does not have BHT! This cereal has a hint of maple flavour and has psyllium fibre that is good to lower cholesterol and maintain healthy body weight and help with digestive health. The box mentions that a cup of this cereal provides 55% of the daily amount of fibre we need. Special K Nourish has two new flavours: Coconut Cashew and Dark Chocolate, and Caramel, Sea Salt and Mixed Nuts that has visible ingredients such as quinoa and gluten free oats. I like that these bars make a delicious on-the-go snack. Kellogg's Vector Protein bars have a new flavour: Trail mix that includes cranberries, sunflower seeds, flax seeds and peanuts. It is partially dipped in smooth chocolatey coating. My children really enjoyed the finger licking delicious flavour of the new Pringles Ketchup Chips. I like that these new products do not have artificial flavour and colour. If you are in Canada and would like to win a prize pack with the eight new products enter the giveaway through the rafflecopter. This giveaway ends February 20th. Please leave comments and follow my social media networks to be eligible to win. Ontario! (Just outside of Toronto).. I would like to win so that I can try the products. 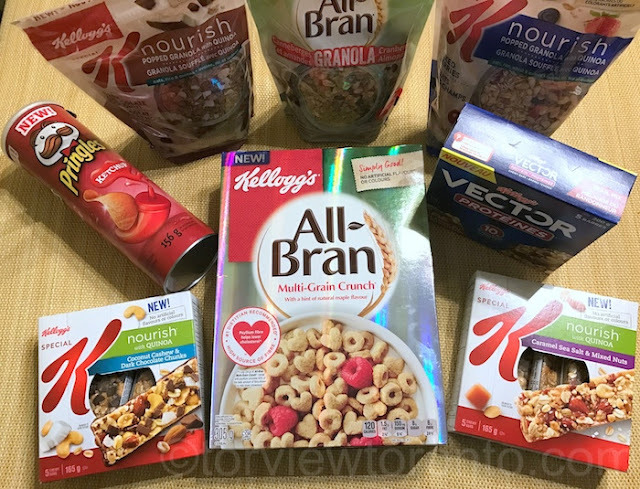 My son loves All-Bran cereal and it will be great for him to try the new flavours. I live in ON, and I'd love to win so I can try these new products! I'm from ON, and I'd love to win so that I can try out these innovative products! I live in BC and I'd love to win because there are a number of products in here that I have never tried. I live in London ON. I would love to win these products as the Special K Nourish Cereal with the coconut looks so good and money is so tight right now. I live in Nova Scotia and we do eat cereal.It would be nice to have some new choices. I live just outside of Edmonton, AB and I would like to win because I really want to try the ketchup Pringles and the All-Bran Multi Grain Crunch cereal. I live in Nova Scotia. There are a lot of new products that I haven't tried yet and I would like to do so. I live in Ontario and would love to have all the different healthy choices to chose from for breakfast. I would love to win these products as I'm particularly interested in trying the Pringles Ketchup chips! I live in NL canada. I would love to try these new products as part of my new healthy eating routine. Thanks! Ontario and I would love to win because I like trying new products. I lie in Ontario. I'd like to win because i'm always looking to incorporate healthy grains into my diet (and my families) and tasty ones like these are a bonus! I live in Ontario and I'd love to win so I can try these new products! I live in Ontario. I'd like to win because Kellogg is one of my favorite brands and this entire prize looks both delicious and convenient. I live in Manitoba and would love to try the Pringles Ketchup chips the most because I love pringles and ketchup chips! I'm from Ontario and I would love to win because I love Kelloggs products and would like to try these. I live in Newfoundland and Kelloggs products are the best. I am excited to try the New All Bran Multi Grain Crunch Cereal. I live in Ontario and love trying new products. I live in Ontario and would love to try all of these products! I am in Calgary and I would love to win so I could try everything out first before I buy! Everything looks delicious. 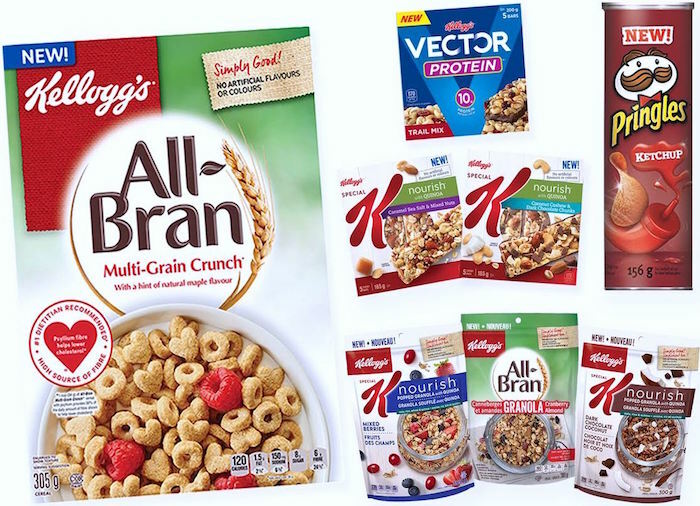 I live in Ontario and I would love to try these new products from Kellogg's, we enjoy their cereals & granola bars daily. I'm in NEw Brunswick and it would be lovely for my family. We like Pringles and cereal. Am in BC. Would love these for yummy breakfasts and snacks! I live in Ontario and love Kellogg's products. I'd be happy to try the newest ones! I live in Ontario ! Oh, my goodness all these products look wonderful. I would love to try Special K Nourish Popped Granola w/ Quinoa – Dark Chocolate Coconut. I love to eat it mixed with yogurt for my breakfast ! Absolutely amazing giveaway ! Thank you so much for the chance ! I live in Ontario and I would love to try all of these products. I'm from Ontario, I would love to win because i love Kellogg's products and would love to try these new products. I would love to win because I think my family would love every single one of these products so I would love to try them out and add them to our cupboards. I am in BC. I live in NS and I enjoy cereal in the morning and all types of breakfast foods. I have 4 teenagers that I want to eat healthier! I'm in Ontario - I'd love to win because it's a great way to try new products without the investment - if I love a product, it will be a regular on my grocery list! Hi,i live in Newfoundland and i would love to win so i could try the new All Bran products. I live in BC. I'd love to try out these new Kellogg's products especially the All-Bran Cranberry Granola. I am in Ontario. I enjoy trying new products, and have been happy with other Kellogg's lines. I live in Saskatchewan. I would like to win because I think my family would enjoy these products. I live in NB and love trying new products, especially food-related ones! I live in Ontario. I would love to win so I can figure out if I like these products before adding them to my shopping list. I am from Ontario and I would love to win these products for so many reasons! I have three little girls who I try hard to feed a balanced diet, and this prize pack offers healthy options along with yummy treats. I also have a hubby who works long hours outdoors so packing his lunch with lots of tasty snacks is important to me. Thank you so much for the chance! I live in alberta. I would love to win these products as we are living a more healthy lifestyle and Kellogg's has always been a part of our lives. These are new products and I would love my family to try them before buying them. I live in Oshawa, ON. I want to win these products so we can find some new favourites! I live in Ontario. These look like terrific products from Kellogg's. Our family would be thrilled to try these items. Thankyou. I live in Ontario and I'd love to try these new products because we've always enjoyed past products from Kelloggs. The All Bran multi grain crunch cereal sounds delicious! I'm in Manitoba. I have an eye on Nourish...Coconut Cashew and Dark Chocolate sounds heavenly! I live in NL. I want to win because I would love to try all these awesome products! I'm in BC. I would love to win because I can't wait to try the Pringles! I also love Kellogg's products. I live in Ontario and I would love to win, I love Special K and would love to try these new products!! I live in Ontario. I'd love the chance to try some new products! I'm in Toronto ON and would love to try the All Bran Multi Grain Crunch Cereal! It sounds fantastic. I live in Ontario and my kids love Kelloggs products. Those nourish granola bars look delicious. I live in Ontario. I'd love to win these products because the Special K Nourish granola and bars look delicious and I enjoy Kelloggs products. I live in Manitoba and love trying out new products. Looking forward to the Pringles ketchup chips.